These are photos of a dental bridge replacement by Sedona dentist Roy Daniels. Dental care is not a product. It’s not hand soap, lunch meat or cellphone wireless minutes. Dental care is a professional service that’s both art and a science, where years of experience of the dentist can benefit the patient. Yes, there are outstanding dentists and not-so-great dentists. Time and again, you get what you pay for. Here is an example of a bridge that a patient had replaced; notice how the old bridge the false teeth were shaped like “Chiclets”, the laboratory did not have a thorough knowledge of dental anatomy and dental function. 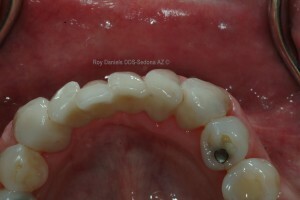 Note the replacement dental bridge which Dr. Daniels placed. Note the detailed anatomy and contour that makes this look more like natural teeth. And the unsightly metal does not show. The first bridge may or may not have been a bargain. The replacement dental bridge was a work of art and function that definitely cost more, but the results are superior. Dental bridge replacement cost can vary; there are outstanding dentists and not-so-great dentists. Time and again, you get what you pay for. Old dental bridge that the false teeth were shaped like “Chiclets”, the laboratory did not have a thorough knowledge of dental anatomy and dental function. Note the detailed anatomy and contour that makes this look more like natural teeth. Note the subtle “overlap” that natural teeth often have. The esthetics were not “forced” and made into “Chiclets”. Zirconia dental bridges are much more esthetic and can be stronger than porcelain baked to metal bridges. 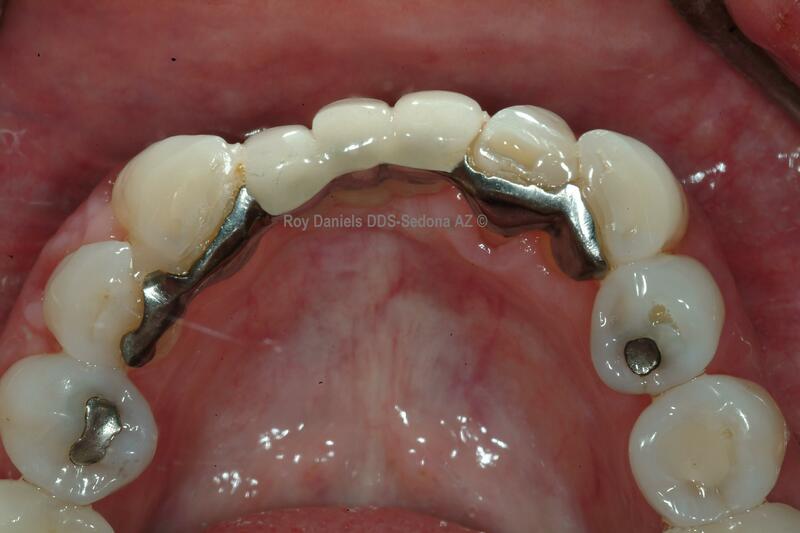 This is a dental bridge replaced by Sedona dentist Roy Daniels. Note the improved contours compared to the old bridge. Dental bridges problems, note the replacement bridge in adjacent photo that replaced this one. This bridge may or may not have been a bargain. 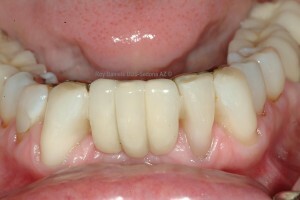 The replacement dental bridge was a work of art and function that definitely cost more, but the results are superior. Labs differ in the superiority of the products they create. When choosing a dentist you would expect your dentist to be using high-quality labs for things like crowns and dentures. Sadly, some dentists use the cheapest lab that they can find. Should you have to ask about the labs? No. You should be able to trust your dentist to select a good one. Sedona dentist Roy Daniels will only use the highest quality, U.S. labs for outstanding results. To place a dental bridge, the teeth neighboring to the missing tooth are crowned so a false tooth can be attached in-between. This “bridges” the gap to replace the missing tooth. This is known as a fixed bridge and cannot be removed by the patient from the mouth. If you are missing one or more teeth, you may benefit from a dental bridge. 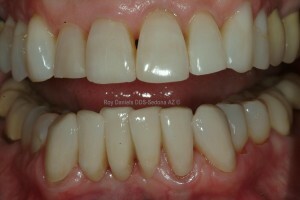 To obtain more information about this restorative option contact Sedona Dentist Roy Daniels at 928-282-3246.